Recently, I asked Martha Sandweiss, a Princeton University historian and author of Print the Legend: Photography and the American West, why people are so attracted to Western photographs — hoping, really, that I’d learn something more about myself. To Sandweiss and Walker, the West in landscape photography is a place beyond history, a place where only the future matters, the West as our last great hope. I agree. Placing this position on one side, say, the positive side, we have the other position that Western landscape photography displaced a painful past (Civil War in this case), created an illusion and omitted actual history (relocating Indians, extermination of vast herds of buffalo, hollowing out natural resources). Both sides fit together although we repress the pain, illusion and facts in favor of a place beyond history. Look at the following three photographs, continue reading and let me explain. 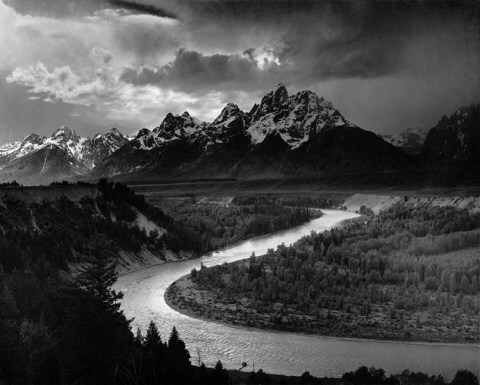 In the three photographs of Ansel Adams, Jeff Lynch and Montucky, each has captured a western landscape in pure form, without human artifice intruding — no church spires, courthouses, schools or bridges. As we wander into these Wests, I submit that we want to leave behind those objects that change the terrain — automobile, antennas, roads. Further, if we seek to preserve these pure forms, we must leave behind the ideologies of exploitation, over-consumption and race. We may desire preservation, but the ongoing drive of the machine into the West can hardly be slowed down, much less stopped, as population expands. We may want to leave behind the ideologies and terrain-changing objects and, though difficult, it is not impossible. I do not view nature in these photographs as a cropping or harvesting opportunity and they are not presented as such by the artists. 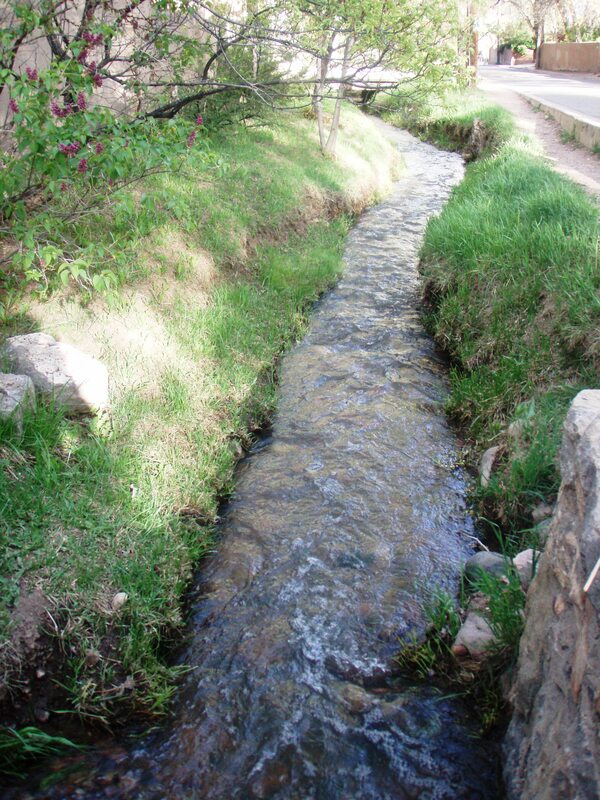 I see rivers, streams, trees and mountains that are in themselves moving and living things, having the same molecular and atomic substance that make up my flesh, bones and hair. Different arrangements for a time, the land and me, but substantially the same. These three photographs give rise, I believe, to humanity’s kinship with the earth and invite gentle, ethical occupation of the land. 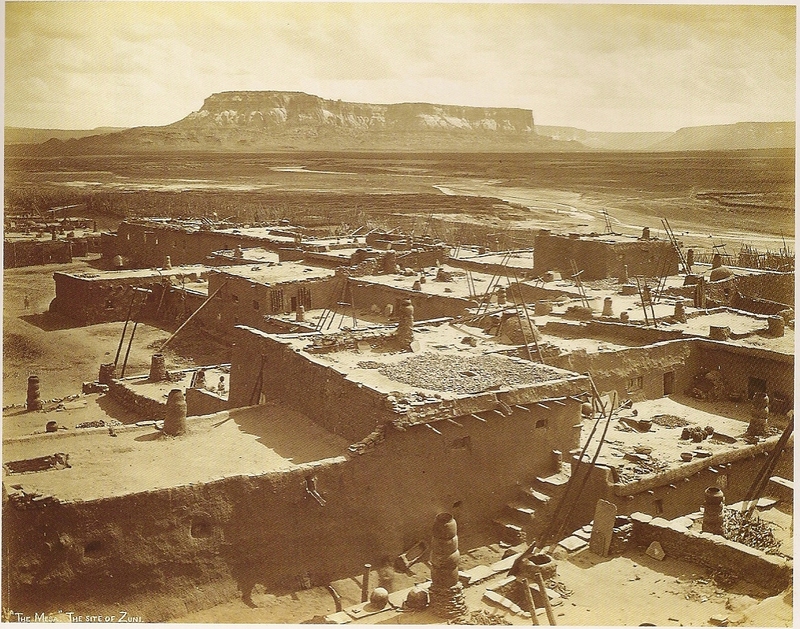 When I move into these Wests I do not want to construct a Monticello, but rather fit my home and hearth into the line and contour of the earth as in John K. Hillers, Mesa at Zuni Pueblo, seen above. Leaving artifice behind, slowing the machine and having kinship with the earth in thought and deed has been tried before, and the dream has died ten-thousand times and it will die again. Sand Creek and Ludlow coexist with the Rockies as backdrop in our history — blood and beauty. Nonetheless, every vignette of western landscape offers the dream again, a chance to move on past the pain of history and into the wild without the machine. Art museums, galleries and photographic books elicit a response in the viewer that there is a purity of form beyond the city, in all landscapes, all regions. As a special art, western American landscape photography matters because it renews again and again what has been torn in our history. We build upon beauty momentarily captured on film and not what has been shattered in history. Western landscape photography can help us transcend what has terribly gone wrong. As a result, I submit, we will take lighter loads and bigger hearts in our wagons when we migrate West next time. It is all there in the photographs, beyond the lens of Adams, Lynch and Montucky. They point the way. Can you not see it? Not all people that view landscape photography of the West will see renewal or lessen their impact on the land. The West is still seen as ripe for exploitation and extraction. New lamentations are writ everyday in the West and many of them are never heard, yet they are always seen — on film. Mesa at Zuni Pueblo from James L. Enyeart, Land, Sky, and All That is Within: Visionary Photographers in the Southwest, Santa Fe: Museum of New Mexico Press, 1998. Additional comment, February 2, 2011. 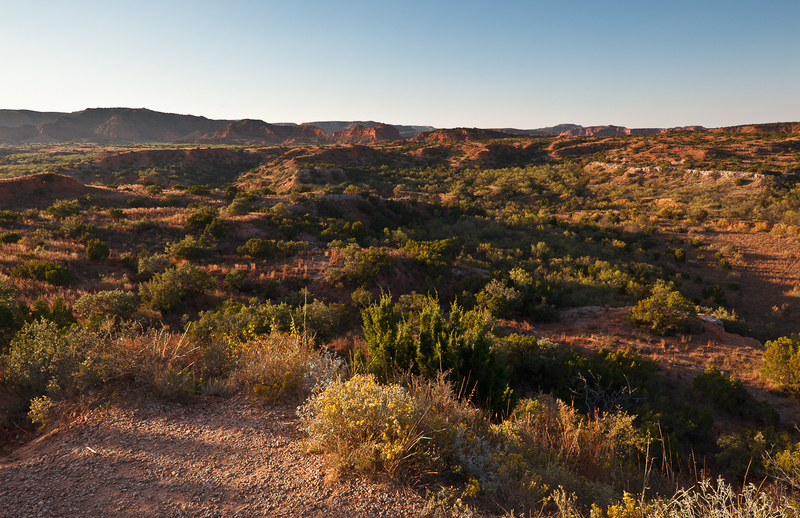 Caralee Woods of Kanab, Utah, sent this by e-mail and I post it as another example of the appeal of the western image. 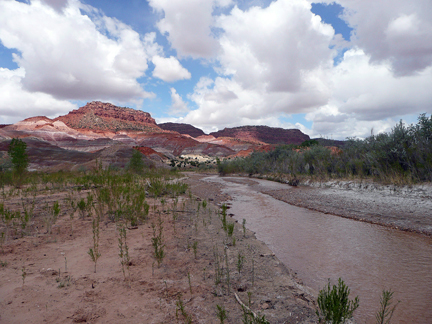 Caralee Woods, Paria River, Grand Staircase-Escalante National Monument, Utah, 2010. In my long commute to Abilene from Mingus, Texas (87.2 miles), I see flora and fauna of Cross Timbers and west Texas plains along Interstate 20. The Clear Fork of the Brazos River is the major river in the area, meandering north of the interstate at a distance I cannot discern from the highway, but within sight of the wind turbines that I see turning swiftly with the wind. Between Abilene and Clyde, Texas, I have seen for several years a particular type of hovering bird above the interstate that dives down, usually on the median, to take a field mouse. The angle of the sun has not been right for me to identify the bird nor have I minimal traffic to definitely type the predator. (Trucks carry a lot of cargo on Interstate 20 between El Paso and Dallas-Fort Worth and must be respected.) 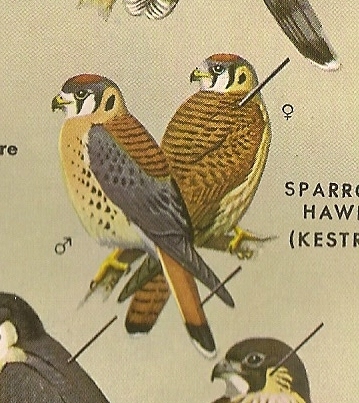 Yesterday, however, at the same spot (about a two-hundred-yard splotch) that I have seen these birds over the years, I was able to identify a Sparrow Hawk (Falco sparverius), as my elusive companion for the commute. The Sparrow Hawk or “American Kestrel” flashed a rufous back, wings spread with blue-gray color and a rufous tail, signifying a male, as it dove onto the median. Returning home, driving east, the sun on my right side at 3:30 p.m. in the afternoon, I saw brightly illuminated the plumage and color of this beautiful hawk. The sighting occurred within five seconds, but I will remember this Interstate 20 Kestrel for a long, long time. How can we ever think ourselves alone when in the absence of our own kind we have kestrel, oak and four-legged companions about? But we do feel estranged. I have and will feel alone again. Yet, so, and despite it all, our senses become filled with flapping wings, stamping hooves and trees swaying in the wind among ten thousand sights and sounds. Our yearning for connectedness disappears with a self-loss in nature’s rhythm, even along the interstate. It is a kind of sacred hoop, Black Elk once said. Considering all the events of the past week, I thought I would pass this e-mail along to you from Courtney Hampton who traveled to Oklahoma City on a mission to see and evaluate Fanny. She bought Fanny and this is her comment on riding her the first day. I just thought I’d give you an update on how Fanny is doing. We arrived at Heritage Place at about 5 a.m. Friday morning and loaded her and Diesel (the other mare we bought) up and headed to Missouri. It was about an eight-hour drive, but we stopped several times to let them stretch. She handled everything very well. When we got her home (about 1:30 p.m.) we turned her and Diesel (aka Ms Royal Fever) out in the big arena (their new home for two weeks until the others get used to them). 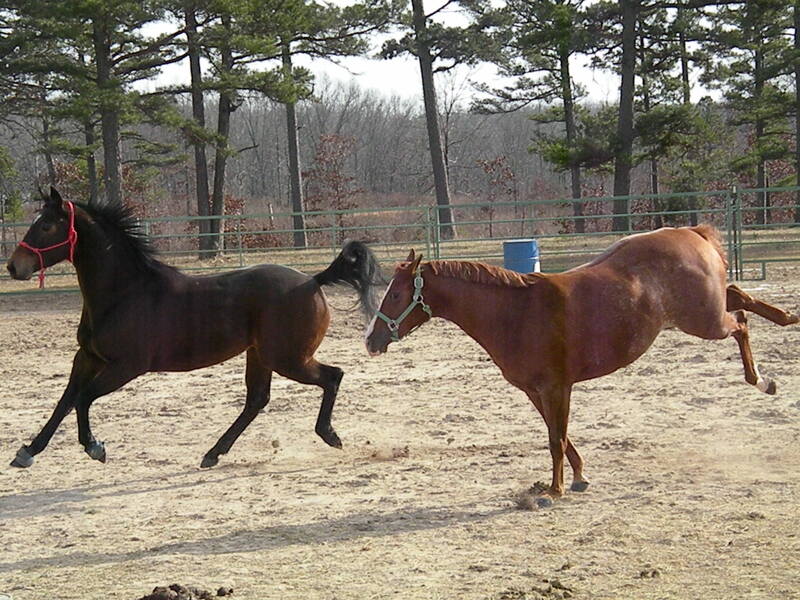 As soon as we let them go they took off and started running and bucking. They were definitely happy to get out of the trailer! 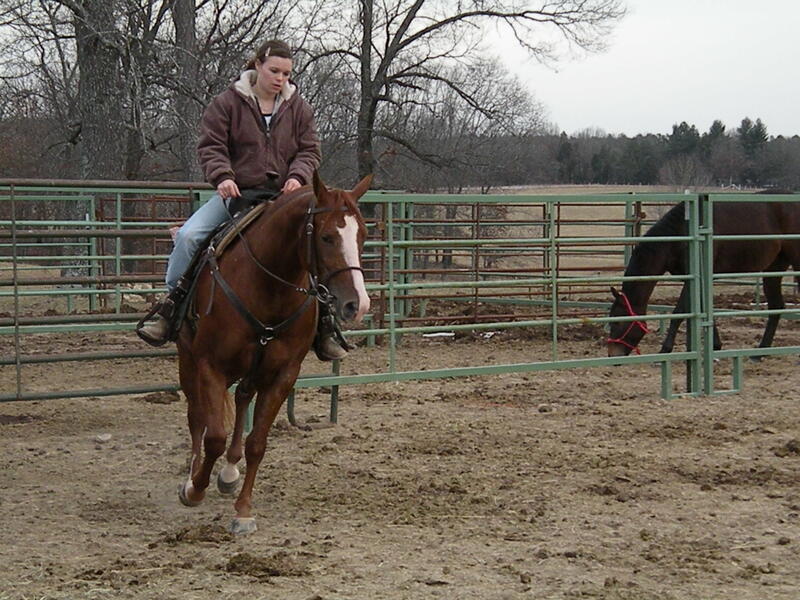 It was about 55 degrees out, so all my other horses started running around too. (It hasn’t been that warm in weeks.) What a sight to be sure! Fanny was sure strutting her stuff! (I will attach pictures.) She and Diesel ran around that arena for half an hour. So cool to watch! After their energy had worn down some I threw some alfalfa out and they went to munching. Later that day, about 4:30 or so, I went down and decided to ride them both for a few minutes just to see how they did. I started with Fanny first as I wasn’t sure how the race mare was going to be (I’ve bought off the track horses before and they can be a little hard to handle). I saddled Fanny and of course she just stood there like a pro. I got on her and rode her around for about 30 minutes and put her through some paces just to see what she could do. She did everything I asked like a champ: roll-backs, counter-bending, side-passing, stop *which that mare can STOP! 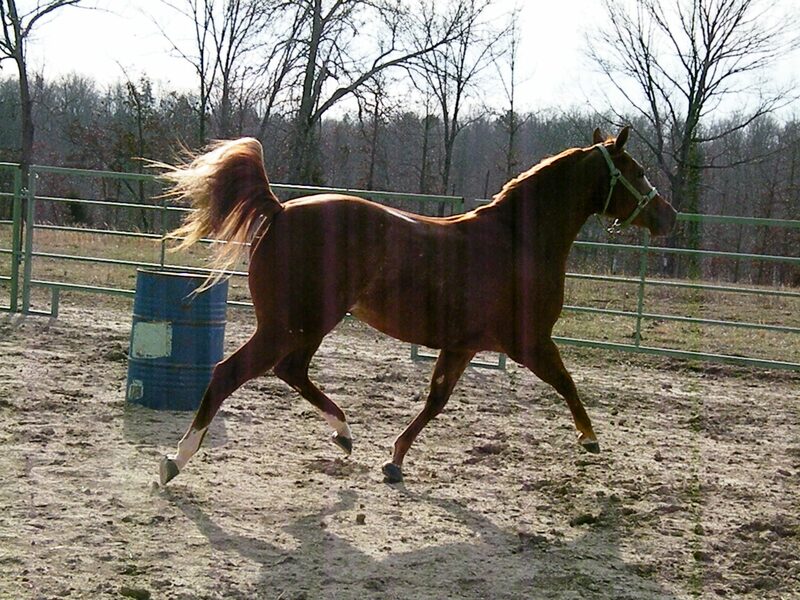 * Then I took her out and walked her around the pasture that we have our weanling calves in. Of course she was very alert and nervous but she never spooked — even when our flock of guinea hens flew by her. She started shaking (poor baby), but then just snorted and walked on. Since she was doing so good I quit her and unsaddled and fed her while I rode Diesel (who has a pretty good handle on her for a race mare and I was pleasantly surprised). This is the sweet side of handing off horses to young people whose attachment to animals renews those of us that have become coarse. Some of the bitter goes away when you hear-tell this kind of narrative. Lilly died today. Born January 20, 1985, at Cibolo, Texas, on the ranch of Janis Hawthorne, she had two issues, the last one being Star Bars Moore who remains on our ranch. Lilly had osteoarthritis. She had been down since yesterday for eighteen hours, but had come up for me this morning. The vets were called at 8:00 a.m. She had alfalfa and a natural sedative to lessen her pain before the vets arrived. I told her I was beside her and not be afraid. She was not. Lilly has been with my family for eighteen years and our grandchildren have ridden her. She carried my stepfather on trail rides for many years and Brenda rode her with great pleasure. 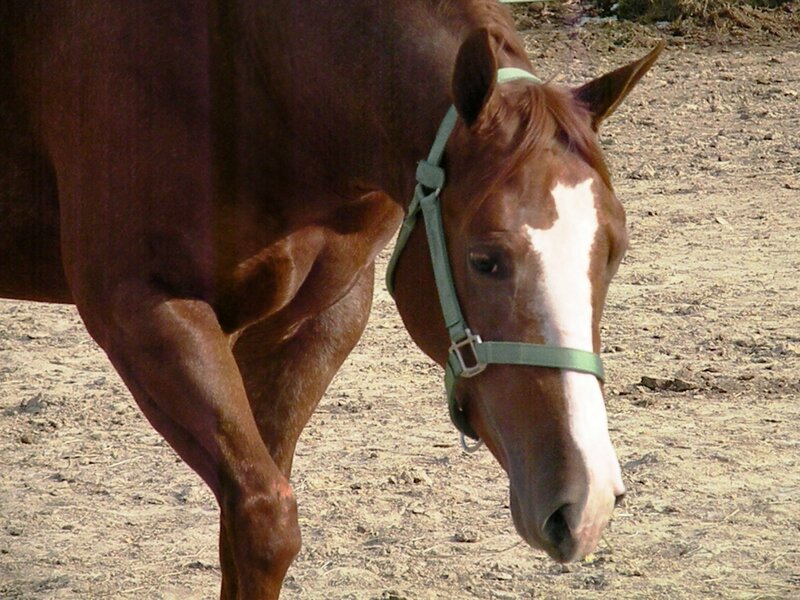 Her son, Star Bars Moore, watched at a distance as we put her down. I had talked to him about what we were doing and he lowered his head, not so much about what I told him for he did not understand, but that I had come directly to him to talk in fair and caring tones. He watched at a distance as I covered his mother in the good earth of this world. We shall miss this fine horse. 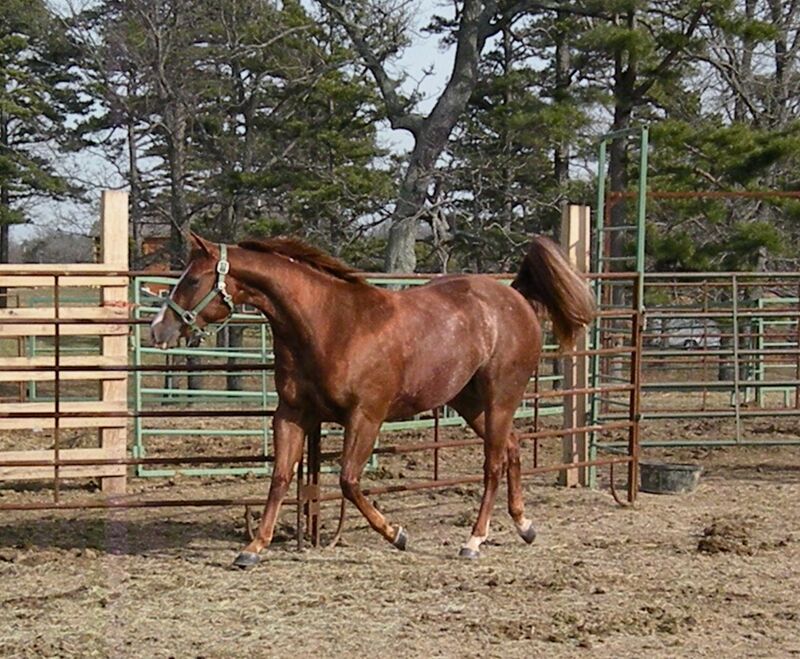 We carried Fanny and Hija and her unborn foal to sale in our two-horse trailer named Equi Spirit. Fanny or Shiners Fannin Peppy sold at the Heritage Place Mixed Winter Sale on Thursday in Oklahoma City. Courtney Hampton of Summersville, Missouri, purchased Fanny. 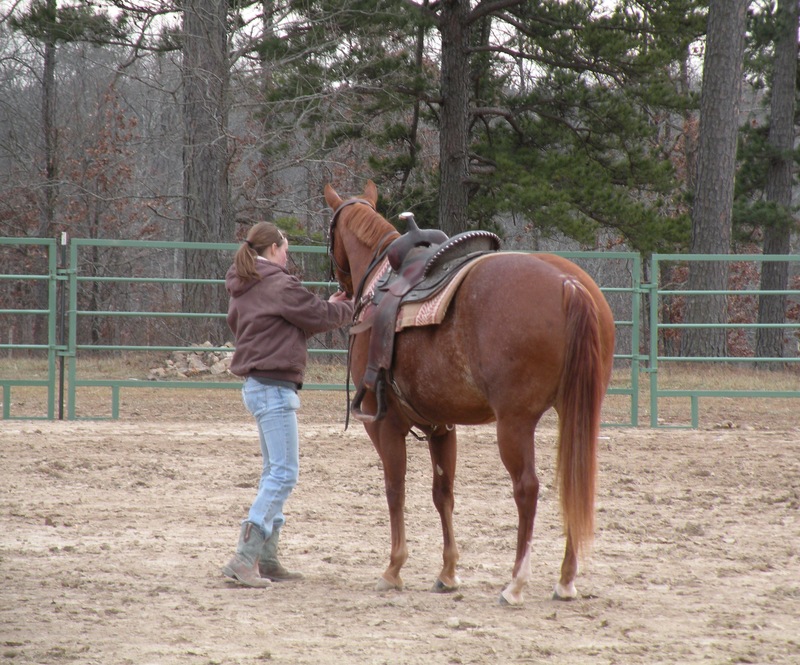 Courtney’s work and pleasure with Fanny will center about Barrel Racing competition and Fanny will do Courtney well. For Courtney and Fanny, it seemed love at first sight. The hind socks on Fanny are white and shaped like wings and I trust Fanny will fly like the wind with Courtney. 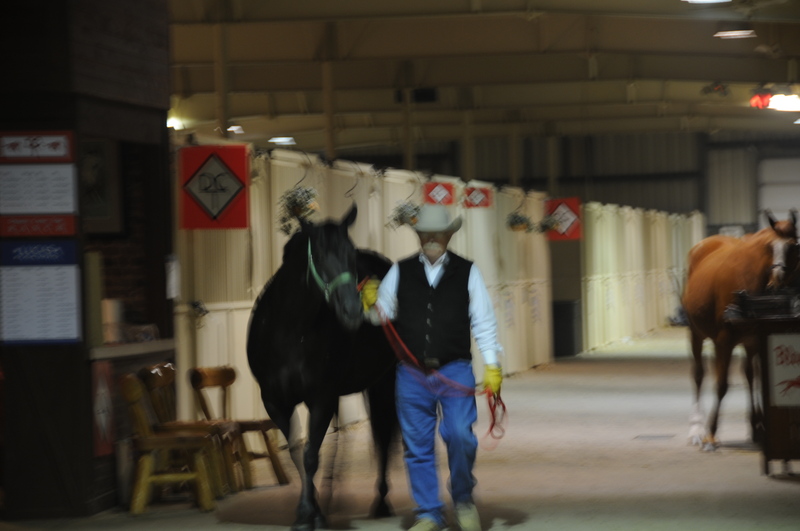 In the listing of horses to be sold at Heritage Place, our second and third horse, Sweet Hija and the unborn foal, came up for bid at 8:00 p.m. Friday night. 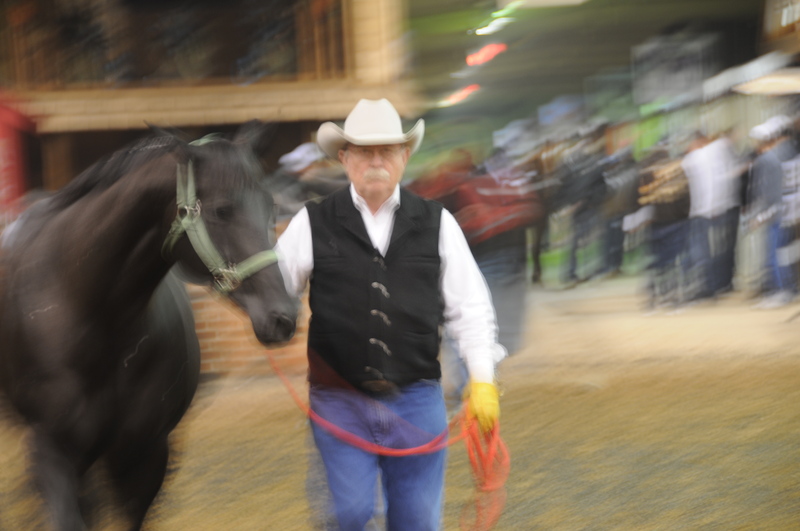 All day long I prepped Sweet Hija and her unborn foal for the big event, going into the make-up ring — a place where you walk your horse in an open area — and then up the walk to the auction arena where a professional handler takes control. 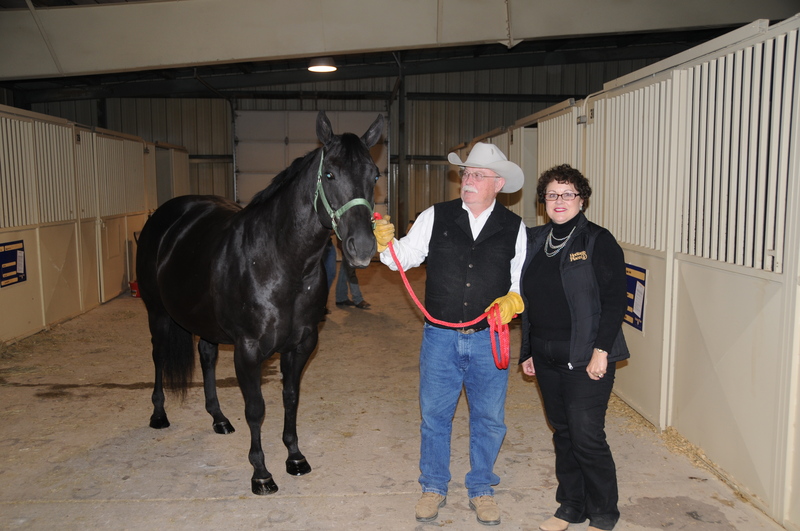 When the presentation began, I walked with Hija and she showed her King Ranch style: energetic, fully alert, stepping high, ears forward. Yet she stayed close by me as I walked her from her left side. For five minutes she presented her Running W, the brand of King Ranch, to the crowd before I handed her off to the handler that took her into the the bidding arena. When she came back to me she was no longer mine. Sweet Hija and her unborn foal passed into the kind and humane possession of Kim Elliott of Calgary, Alberta, Canada. 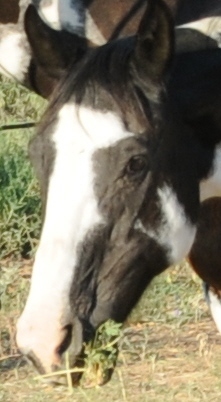 Sweet Hija and her foal will reside near Calgary, on land and terrain that gave Bierstadt panorama to the films, Open Range and Legends of the Fall. Kim Elliott acted and her horses performed in both movies. Ms. Elliott told me and Brenda that When horses come to our ranch, they are there for good and they have the terrain of Open Range to look at day after day. How can Brenda and I be so happy and mournful at the same time for the unexpected fortunes of our three horses? We are and we will be. Sweet Hija and foal's new home with Kim Elliott on the open range near Calgary, Alberta, Canada. 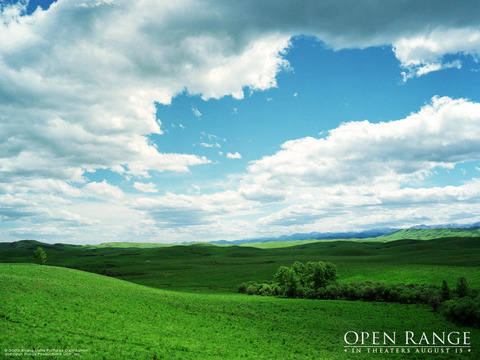 The spring of five months ago was the most beautiful spring I have ever lived in. The year before I had not known all about the trees and the heavy peach blossoms and the tea-colored brooks that shook down over the brown rocks. Five months ago it was spring and I was in school. In school the white limbs beyond the study hall shook out a greenness, and the tennis courts became white and scalding. The air was empty and hard, and the vacant wind dragged shadows over the road. I knew all this only from the classrooms. I knew about the trees from the window frames, I knew the rain only from the sounds on the roof. I was tired of seeing spring with walls and awnings to intercept the sweet sun and the hard fruit. I wanted to go outdoors and see the spring, I wanted to feel and taste the air and be among the shadows. That is perhaps why I left school. In the spring I was glad to leave school. Everything outside was elegant and savage and fleshy. Everything inside was slow and cool and vacant. It seemed a shame to stay inside. ~ John Cheever, “Expelled,” The New Republic, October 1, 1930. I think it important, even redemptive, that I spend time in nature, away from the classroom or ranch house, walking in pasture and grove. Yes, I know, it is all nature, even within four walls — the air, the sunlight, the particles of dust and skin floating within the house. Without walls, however, weather intrudes, scents come sharply and trees present their foliage. Wildlife intersects the trail. When I lectured at T. C. U. one semester, I taught from a second-story lecture hall with an array of seven or eight windows looking out upon elms and green grass about the campus. It was a western civilization class of thirty students. Often I went to the windows while lecturing, propped my elbow on the ledge and instructed undergraduates while frequently glancing into the seasons outside the panes. I liked that classroom and sometimes dream of it. Field work in anthropology never tired me. Surface surveys for isolated occurrences of stone tools or hearths carried me from arroyo to mesa in New Mexico. Boots dusty, sweatband wet and Levis soiled at the end of the morning offered solid evidence of my toil. I thought of people, long ago, that walked the same good ground, gazing at Cerro Pedernal. My students that I led into the field, without fail, always returned to the classroom the next day invigorated, talkative and inspired. The field instructed, not me. 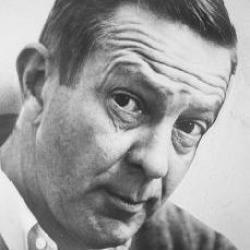 John Cheever, “Expelled,” The New Republic, October 1, 1930, reprinted in The New Republic, January 5, 2011. I wrote my dissertation in Fort Worth, Texas, from a second-floor office, looking out upon an enclosed patio. Adjacent to the large window that framed my view were White Fringetrees that bore dark blue berries. I composed intently and turned frequently to the window, yearning to be in high country, viewing pinon, spruce and ponderosa, not the Fringetree in a hot Texas summer. 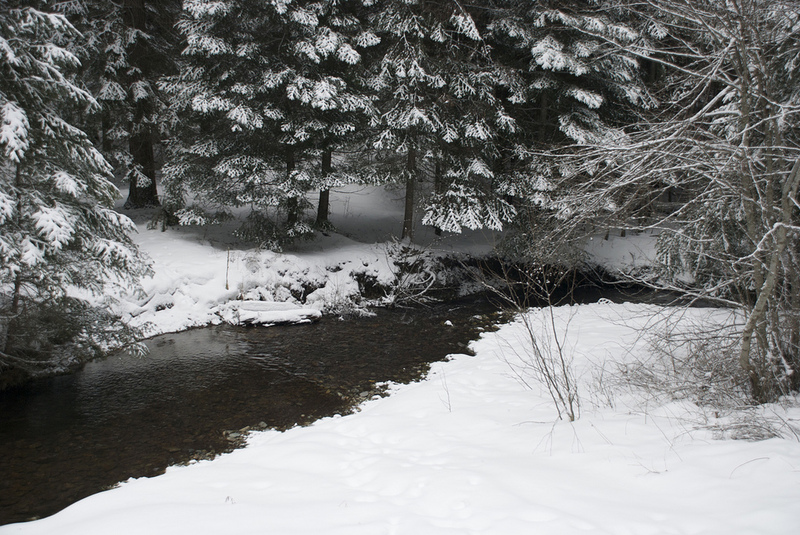 One afternoon as I churned out sentences I saw birds fly onto and into the White Fringetrees. Not just a few, but hundreds of birds landed on tree branches, weighing them down, almost to a point of snapping the branches from the tree trunk. I turned away from writing and gazed upon Tufted Titmice engorging fringetree berries (1). The animated flock, chirping and calling loudly, ate for fifteen or twenty seconds and then abruptly flew away, out of sight, in a orchestrated arc of motion. I was stunned at clasping claws, fluttering wings, pecking mouths and swarming birds within ten feet of my desk. No sooner than I began to think about their behavior the titmice returned, engorging and hanging upside down, flying crazily away, drunk upon the nectar, happily filled. They stripped the tree of berries after two more returns to the table and I never saw them again that summer. I waited for a few to return in the remaining days, but they never flew back. I revere that image. I thought then, as I do now, that the berry feast of swarming titmice lifted my mood and helped propel me to finish my dissertation, for at my desk I saw nature churning, grasping, eating and flying. High country, after all, in Texas. 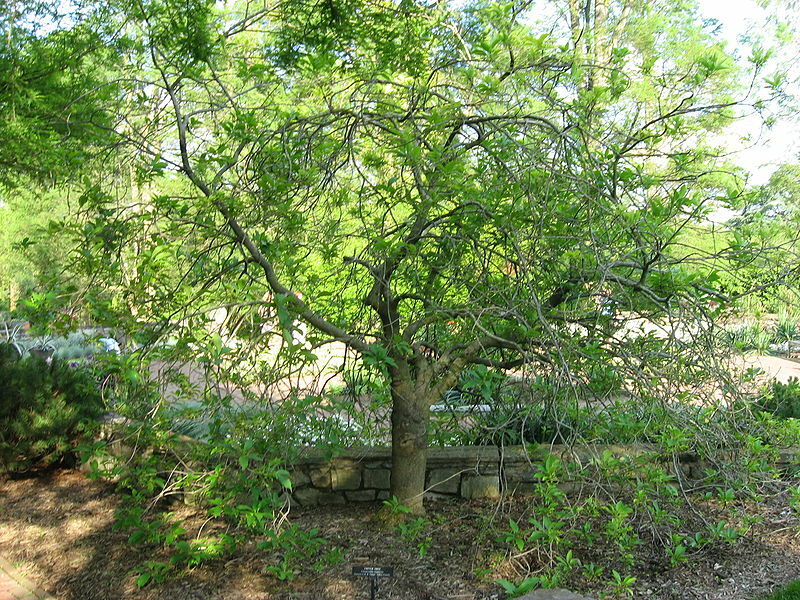 The White Fringetree (Chionanthus virginicus), http://en.wikipedia.org/wiki/Chionanthus_virginicus. See also Rutgers Landscape and Nursery Services, New Jersey. 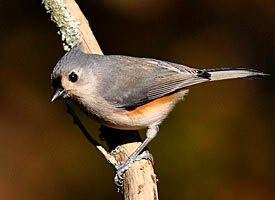 Tufted Titmouse, Identification, All About Birds – Cornell Lab of Ornithology (Baeolophus bicolor). One morning on the high plains of Wyoming I saw several pronghorns in the distance. They were moving very slowly at an angle away from me, and they were almost invisible in the tall brown and yellow grass. They ambled along in their own wilderness dimension of time, as if no notion of flight could ever come upon them. But I remembered once having seen a frightened buck on the run, how the white rosette of its rump seemed to hang for the smallest fraction of time at the top of each frantic bound — like a succession of sunbursts against the purple hills. — N. Scott Momaday, The Way to Rainy Mountain, p. 19. In the early seventies, between Clayton and Springer, New Mexico, Charles Fairweather and I drove fast to the Sangre de Cristos for our yearly getaway with several other friends who had already made camp. We came up out of the roadbed onto a small hill and to the right, off the highway about 200 feet, were several pronghorn. Charles quickly stopped the car and pulled out his deer rifle. Charles, I said, let the pronghorn be. Besides, it would be poaching if you shot him. He was a good man, but impulsive at times. He re-sheathed his weapon without a word and drove on to camp. 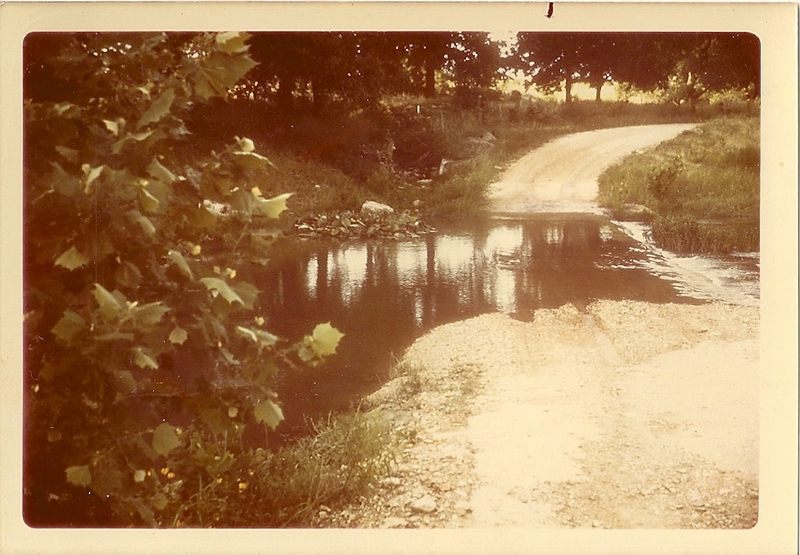 Between Snyder and Post, Texas, large ranches abound. 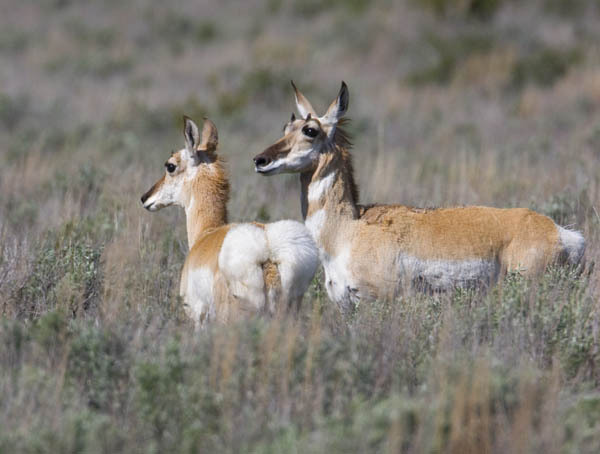 On one ranch, the Covered S, I saw pronghorn graze five years ago. In the last four years, with the placement of wind mills for power and an extensive clearing of brush, I see no pronghorn. They grazed in pastures on either side of highway. This holiday, as we traveled to Lubbock, I looked intently onto the eastern pasture of the Covered S, hoping to see white rump in brown and yellow grass. I saw none on either day we passed the Covered S. I counted plenty of oil wells, but no antelope. In the Journals of Lewis and Clark, they reported that antelope would rub themselves against sagebrush in order to perfume themselves.